This assortment of salts is flavored with six different spicy pepper blends. 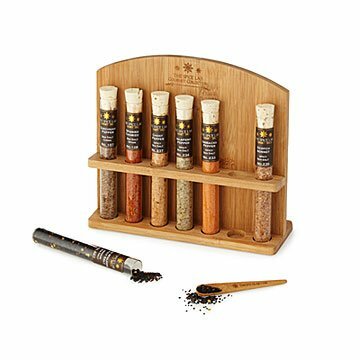 Variety really is the spice of life, and that spirit runs through this lively assortment of spiced sea salts. It includes salts infused with habanero peppers, smoke chipotle, sriracha, jalapeño, chorizo spices, and a hot Hawaiian "fire walker" mix. They'll add complex kick to your favorite foods, whether for cooking, finishing, or table use. The seven varieties are presented in corked test tubes, showing off their texture and latent heat in between recipes. The set comes displayed in a stylish rack that's hand-cut from pine by Brett Cramer. And once your salts run out, add some flavor to your home decor by using the test tubes as delightful bud vases. Test tubes and rack made in the USA; salts from around the world. Test tubes can be hand washed and reused. Wipe rack with damp cloth to clean. My wife has gone through a few of the salts so quickly that I've already ordered a second one. She loves all of them. While the item looks nice and the salts are fun to use, it was disappointing not to have the correct keycard with the spices. May not include the flavor you want! I absolutely love the product, and I'm glad to have gotten my stepdad a gift that he actually uses, but was disappointed that it didn't include the right salts.. as advertised in the product description, anyways. "Salt Flavors Included: - Ghost Pepper [Was replaced by Cyprus Wild Garlic Flakes No.97] ... - Szechuan Pepper [Was replaced by Smoked Chipotle No.235]"
I will buy this product again!!! She loves to cook, and absolutely loves the different salts! I love your magazine and all the unique gifts I find in it! Not only great tasting, but also an attractive display! Great product and packaging. Cute gift for food lovers and home chefs. The price is a little much for the amounts you get. This was anniversary present for some friends of mine that LOVE salt. They tell me it is wonderful. They said 4 were spicey and 2 were mildly spicey. Except we haven't used it yet. Fther's Day. I bought this for my boyfriend for Valentine's Day. He puts Tabasco on everything so I thought this would be a more classy alternative. It was all that and more. I even liked them. And we both enjoyed trying the dofferent flavors on various dishes. I highly recommend this for any pallet.